Wild parrots don't resist bedtime. The moment the sun sets, they instinctually know it's time to catch some Z's; they'll generally remain asleep until morning. The sleep habits of parrots vary from species to species, but they all value their shuteye, according to biologist Toa Kyle as cited on the BirdChannel.com website. Budgies in captivity don't typically become loud at night unless something is preventing them from a sound sleep. Parrots require a full night's sleep to function at optimum performance during the waking hours, just like humans do. Your budgie requires 10 to 12 hours of shuteye in every 24-hour cycle, which is vital for his immune system and well-being. Most budgies will sleep throughout the night without waking or making noises. It's important that your budgie obtain his required amount of sleep so he remains a happy and healthy bird during the day, according to parrot behavioral consultant and author Mattie Sue Athan on BirdChannel.com. Bird sleep deprivation can cause excessive squawking, nippiness, aggression and feather destruction. The amount of daylight and artificial light that your budgie receives each day influences his noise levels. If your budgie is getting 15 hours or more of daylight or artificial light, it could be triggering an increase in his hormonal activity and stimulating him, causing him to become loud during the night. To lessen hormone activity, don't allow more than 10 to 12 hours of daylight or artificial light each day. Parrots in the wild naturally fall asleep on a sunset-to-sunrise schedule. Create an environment for your budgie that will help him sleep soundly throughout the night. In the wild, budgies sleep in hollowed-out trees, which help them feel secure and safe. Simulate that cozy natural environment by draping a towel, sheet, or other opaque cover over the cage so your budgie will respond with his natural inclination to sleep. You can also put the bird in a sleep cage every night, which is a smaller cage than his daily cage. Place the cage in a dark, quiet room where no human will enter during the night and he won't be disturbed. Turn off all air conditioners and fans so no breezes blow through his sleep cage. The budgie living in captivity often puts up with many nighttime distractions that a wild parrot never has to deal with. You might be contributing to your budgie's wakefulness during the night by creating noise and other distractions in your home. If you're watching the evening news, playing loud music, talking loudly, playing with the dog or children, or preparing midnight snacks, your budgie will be prevented from a sound sleep and might make loud noises, even if you cover the cage. 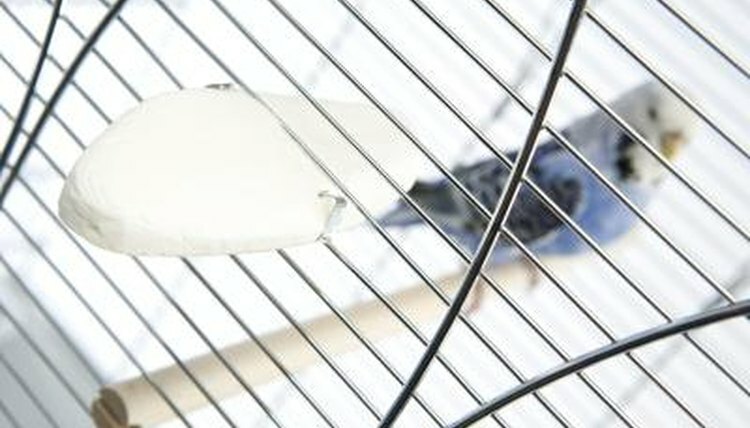 Keep the noise and activity level down in your home after a certain hour so your budgie can obtain a full night's sleep. The Laughing Parrot: Dealing With Hormones - or - My Bird Is Driving Me Crazy!